The upcoming K 2013 (16 – 23 Oct., Düsseldorf) will have a unique focus on plastic packaging: in mould labelling – a plastic decoration technique in which a label and its packaging fuse during the injection, thermoforming or blow moulding process. Verstraete in mould labels, one of the world’s leading IML label suppliers, is proud to be the preferred partner for 16 IML systems @ K 2013. 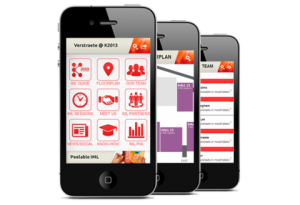 To guide you through the IML solutions at the K 2013 and to make sure that you get all the useful information, we created an IML app (Apple, Android, Web). Save time – All 16 IML systems in one convenient app. Learn all technical information about the IML solutions running at the K 2013. Network with our IML label Specialists. Get inspired by reading about the latest IML label innovations. Come and visit us in Hall 5, booth B27. Verstraete IML App guides you through the 16 IML systems at the K 2013!